As individuals, we at Change Communications have long been passionate about causes and organizations that improve communities and advance civil rights. After all, we named ourselves after an oft-used Gandhi quote (sorry to be so clichéd but it’s a darn good quote!). 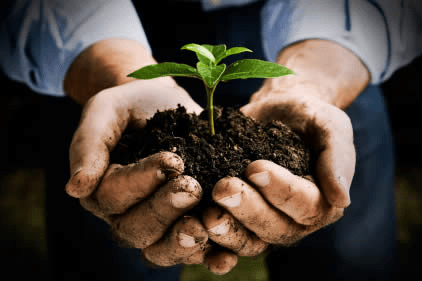 In our years working with nonprofit and community-based organizations, we have noticed a tremendous void in their PR and communications efforts. Namely, that many organizations simply couldn’t afford this extremely important aspect of their operations. With tighter budgets and federal funding going by the wayside, many nonprofits cannot sustain their organizations without PR/communications, but most of them can’t afford it or don’t have the energy/resources to dedicate towards it. When we started Change Communications, our intention was to dedicate a significant amount of time doing pro bono work to help nonprofit organizations that we are passionate about. We haven’t been able to dedicate as much time as we initially wanted, or thought we would, due to the reality of running our little PR firm but we have spent some time working with a few great community-based nonprofits that our friends have steered us toward. Now it’s time to open our services to others looking for this kind of help. If you’re a U.S.-based not-for-profit (with 501(c)(3) status) that serves the community for progressive causes, we want to help you. We don’t work on political campaigns and we are nonpartisan. We also want to stay focused on domestic organizations because, quite frankly, the international market is a difficult one to tackle, and we want to leverage our strengths. If you’re an organization that actively fights to suppress people’s rights, e.g. if you’re against gay marriage, want to limit a woman’s right to choose, or think that it’s totally cool for oil companies to destroy the environment, then we have NO interest in helping you. In fact, we will actively work against you. -Will you have a dedicated point of contact who will serve as the PR liaison? You can send this email to katy(at)bethechangepr.com with “Nonprofit needs help” in the subject line, or hit us up on Facebook and Twitter. We won’t be able to assist every organization that contacts us but we’ll hopefully be able to steer you in the right direction. We are looking forward to changing your communications, and hopefully, helping you change the world. Ever wonder what 500 slices of apple pie looks like? On Wednesday, June 12 from 11am-2pm at Jillian’s across from the Moscone Center (HQ of WWDC), mobile marketers TapSense will be giving away 500 slices of apple pie, all in celebration of the launch of their new developer website, because TapSense helps developers gets a slice of Apple (pie). Not only will apple pies be slung, but TapSense will also give away 10 Sony MDR-V55 DJ-style headphones to the first ten pie recipients, and 25o t-shirts. Plus, one lucky winner can check under their plate to see if he/she has the “Golden Ticket” which will win them an iPad Mini, courtesy of TapSense. TapSense is going freebie-crazy by also offering the first 20 developers to sign up for their new developer SDK $10 eCPM. So if you’re a developer, sign up and get your $10 eCPM and come on down to Jillian’s on June 12 for your slice of Apple (pie). Make sure you RSVP and have your WWDC badge on hand. Oh, and we didn’t even mention TapSense’s Twitter/Instagram/Vine giveaway, where anyone who takes a SFW picture or Vine with an apple and uses #SliceOfApple until 6/14 can also win an iPad Mini. Just think of TapSense as the Oprah of mobile marketing – you get an apple pie and you get an apple pie and YOU GET AN APPLE PIE!See you at Jillian’s! Who is Chuck Rivers? Imagine if Johnny Carson and Mike Douglas had a bourbon-sipping, chain-smokin, man’s man love child. Nostalgic for the days when talk show hosts really did rule the world (those guys would have eaten Jay Leno and Jimmy Fallon for breakfast, lunch and dinner), “The Chuck Rivers Show” is the brainchild of filmmaker William “Billy” Butler, embodied by the ridiculously funny actor and Groundlings alum Laird Macintosh. Featuring live dancers and a full band, “The Chuck Rivers Show” is a new live comedy theater show, a hilarious love letter to the ’70’s, a time when Calgon was considered an “ancient Chinese secret.” Chuck Rivers is a popular talk show host in 1975, at the peak of his popularity, and you get a ticket to his live show as he entertains guests both famous (Ann Margret) and unusual (back to that ole Calgon). Some of the funniest comedians in the business, like Wendi McLendon-Covey (“Bridesmaids”) and Mindy Sterling (“Austin Powers”), portray Chuck’s guests. Rotating stars make every show fresh, almost like you just bathed with Calgon. 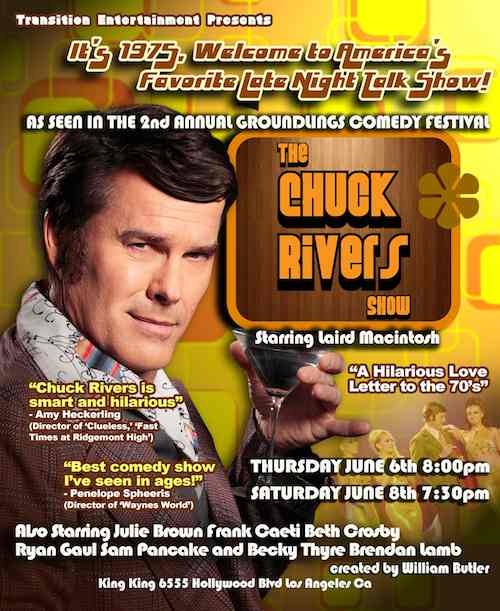 “The Chuck Rivers Show” debuted to a two-night, sold-out performance in King King in April, was invited to perform at the 2nd Annual Groundlings Comedy Festival in May, and will now be performing five shows through June at King King. Ticket information for the shows, which kick off Thursday, June 6 at 8:00pm, is here. You can also find Chuck Rivers on Facebook. Be sure to check out one (or all) of the five shows at King King. Now take me away, Chuck Rivers!